73 x 92 cm - 28 11/16 x 36 3/16 in. Atelier Degas - Vente Degas, 1918, I, n° 97 (repr.) - Jacques Seligmann, New York - Vente New York, American Art Galleries, 27 janvier 1921, n° 51 - Knoedler & Co., New York/Londres/Paris - Henry Hughes, Philadelphi[Mari Sterner Galleries] - Chester Dale, 10 novembre 1928 - Washington, National Gallery, 1963 (Don Chester Dale). New York, Museum of French Art, 1931, n° 11 - Washington, National Gallery, 1965, checklist (n.n.) 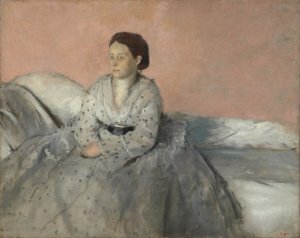 - Washington, National Gallery, 2010-2012, Impressionism to Modernism. The Chester Dale Collection, (n.n). Art News, 24 avril 1929 (repr.) - Dale, Before Manet to Modigliani, 1929, pl. 26 (repr.) - Grappe, 1936, p. 14, 17 (repr.) - Catalogue of French Paintings from the Chester Dale Collection, National Gallery, Washington, 1941, p. 6-7, repr. pl. XII - French Paintings from the Chester Dale Collection, National Gallery, Washington, 1942, p. 37 (repr.) - French Paintings from the Chester Dale Collection, National Gallery, Washington, 1944, p. 37, (repr.) - Lemoisne, 1946-1949, II, n° 313, repr. p. 159 - Rewald, "Degas and His Family in New Orleans", Gazette des Beaux-Arts, vol. 30, août 1946, p. 115-117 (repr.) - Rewald, 1946, p. 229 (repr.) - Huntington, Walker, Great Paintings from he National Gallery, Washington, 1952, p. 154 (repr.) - French Paintings from the Chester Dale Collection, National nGallery, Washington, 1953, p. 47 (repr.) - Walker, National Gallery, Washington, 1956, p. 54 (repr.) - Boggs, Portraits by Degas, 1962, p. 40-41 (repr.) - Walker, National Gallery, Washington, 1964, p. 262 (repr.) - Cat. exp. Isaac Delgado Museum, La Nouvelle Orléans, 1965, p. 38 (repr.) - Eigteenth and Nineteenth Century Paintings and Sculpture of the French School in the Chester Dale Collection, National Gallery, Washington,1965, p. 76 (repr.) - Summary Catalogue of European Paintings and Sculpture, National Gallery, Washington, 1965, p. 39 - Huntington, Walker, European Paintings from the National Gallery, Washington, 1966, p. 438 (repr.) - European Paintings and Sculpture, National Gallery, Washington, 1968, p. 32 (repr.) - Lassaigne, Minervino, 1974, n° 355, repr. p. 102 - European Paintings : An Illustrated Catalogue, National Gallery, Washington, 1975, p. 98 (repr.) - National Gallery Report, Washington, 1976, p. 60-61 (repr.) - Walker, National Gallery, Washington, 1984, p. 472, n° 695 (repr.) - European Paintings : An Illustrated Catalogue, National Gallery, Washington,1985, p. 121 (repr.) - Bernard, The Impressionist Revolution, 1986, p. 260 (repr.) - Kelder, The Great Book of French Impressionist, 1997, n° 263 (repr.) - Cat. exp. Ordrupgaard, Copenhague, 1999, p. 22 (repr.) - Feigenbaum, Cat. exp. 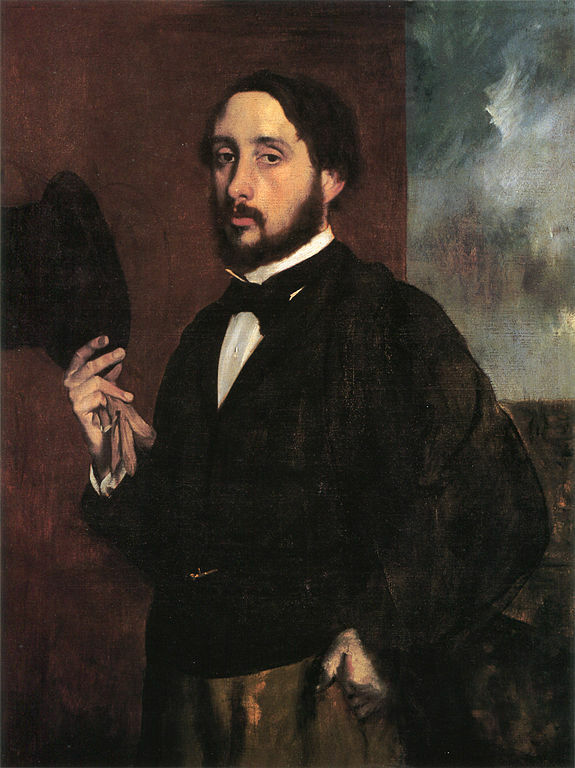 Degas and New Orleans: A French Impressionist in America, 1992, p. 297-208 (repr.) - Hand, National Gallery, Washington : Master Paintings from the Collections, 2004, p. 377, n° 310.